Want a more portable Bible? Take the Word with you wherever you go! 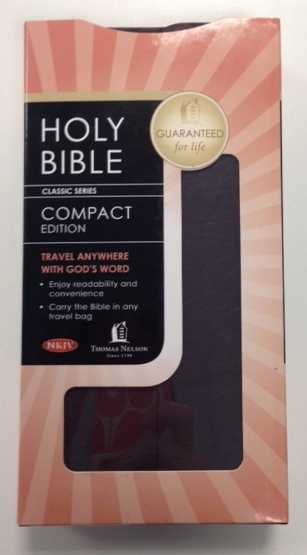 Nelson's Classic Companion Bible offers a complete New King James Version Bible in a handy size that's perfect for purse, suitcase, backpack, or briefcase. If you're a daily commuter, frequent flyer, or just hitting the road for the fun of it, this Bible can be your constant companion. NKJV Classic Companion Bible by Thomas Nelson was published by Thomas Nelson in January 1920 and is our 2064th best seller. The ISBN for NKJV Classic Companion Bible is 9780840785428. I've owned this bible for almost ten years now and it has been an excellent companion. It is the first 'pocket' Bible I've seen that actually might fit into a pocket. The print is small, but not illegibly so. There is not much room for notes or underlining either, so probably not best for those who read with a pen in hand. Got a question? No problem! Just click here to ask us about NKJV Classic Companion Bible. Do you have this exact Bible but without the flap? Are the words of Christ red please? And does it have a Concordance? A:Yes, this edition features the words of Christ in red text, but it does not include a Concordance.